The official emblem of Australia – the kangaroo. 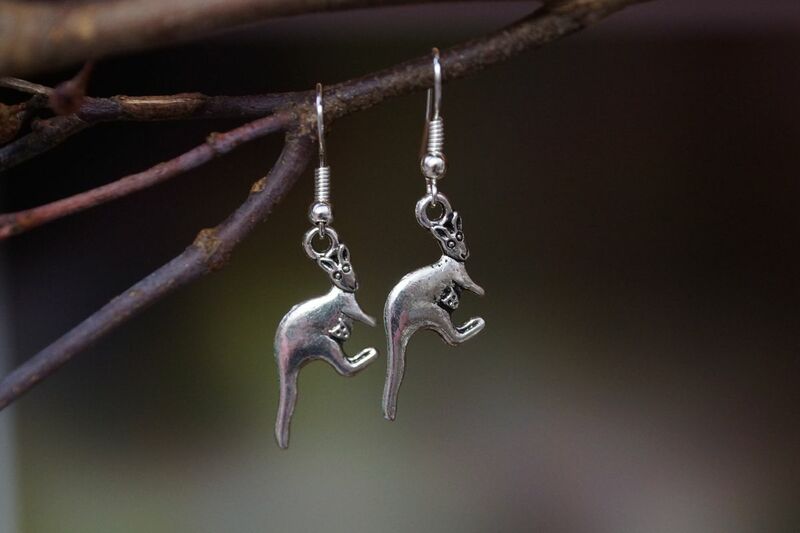 The kangaroo charms on these earrings are made from Tibetan silver, the hooks are sterling silver plated and made into earrings here in Australia. These silver kangaroo and joey earrings are a delight to own and make delightful gifts for friends and family here in Australia or overseas. Did you know that kangaroos can't go backwards and that joeys are only around 1cm in size when they are born and make their treacherous journey to the pouch where they will spend the next several months before they make a second appearance into the world. For hygiene reasons The Land Down Under - Australia does not allow exchanges or returns on earrings - please choose carefully.